I should say first of all that Chopin’s 1st Piano Concerto is one of my favorite pieces of music in the world….but this is pretty close. 1 Jn 4:16), I observed that “being Christian is not the result of an ethical choice or a lofty idea, but the encounter with an event, a person, which gives life a new horizon and a decisive direction … Since God has first loved us (cf. 1 Jn 4:10), love is now no longer a mere ‘command’; it is the response to the gift of love with which God draws near to us” (Deus Caritas Est, 1). Faith is this personal adherence – which involves all our faculties – to the revelation of God’s gratuitous and “passionate” love for us, fully revealed in Jesus Christ. The encounter with God who is Love engages not only the heart but also the intellect: “Acknowledgement of the living God is one path towards love, and the ‘yes’ of our will to his will unites our intellect, will and sentiments in the all-embracing act of love. But this process is always open-ended; love is never ‘finished’ and complete” ( ibid., 17). Hence, for all Christians, and especially for “charity workers”, there is a need for faith, for “that encounter with God in Christ which awakens their love and opens their spirits to others. As a result, love of neighbour will no longer be for them a commandment imposed, so to speak, from without, but a consequence deriving from their faith, a faith which becomes active through love” ( ibid., 31a). Christians are people who have been conquered by Christ’s love and accordingly, under the influence of that love – “C aritas Christi urget nos” ( 2 Cor 5:14) – they are profoundly open to loving their neighbour in concrete ways (cf. ibid., 33). This attitude arises primarily from the consciousness of being loved, forgiven, and even served by the Lord, who bends down to wash the feet of the Apostles and offers himself on the Cross to draw humanity into God’s love. Please, in your charity, offer a prayer or two for me. My wishes for a calm and peaceful evening to you all. On a night like tonight, here, wherever I am or you might be, I find this piece to lift my soul to God. My sincerest hopes and prayers that it might bring you the serenity that it brings my mind and heart. Every day, from one end of the earth to the other, in the highest heights of the heavens and in the profoundest depths of the abysses, everything preaches, everything publishes, the admirable Mary! The nine choirs of angels, men of all ages, sexes, conditions and religions, the good and the bad, nay, even the devils themselves, willingly or unwillingly, are compelled by force of truth to call her Blessed. 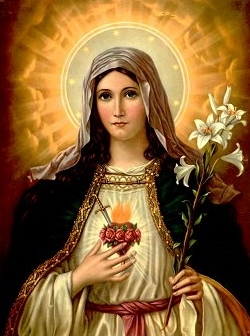 Saint Bonaventure tells us that all the angels in Heaven cry out incessantly to her: “Holy, holy, holy Mary, Mother of God and Virgin;” and that they offer to her millions and millions of times a day, the Angelical Salutation, Ave Maria, prostrating themselves before her, and begging of her in her graciousness to honor them with some of her commands. Even Saint Michael, as Saint Augustine says, although the prince of the heavenly court, is the most zealous in honoring her and causing her to be honored, and is always anxiously awaiting the honor of going at her bidding to render service to some of her servants.